2. 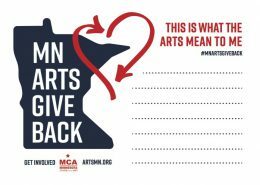 Spread the word to legislators and the public about how the “Arts Give Back” using the downloadable tools, programs ads and social media images below. 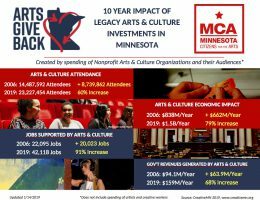 The economic impact of Minnesota’s artists, audiences are arts and culture organizations is over $2 Billion a year. Minnesotans attend and participate in the arts to a higher rate than other Americans and are more likely to be artists, musicians, actors and dancers themselves. 90% agree that creative activities and the arts are contributing to Minnesota’s quality of life. Attendees at nonprofit arts events spend an average of $22.87 per person, not including the cost of the ticket on restaurants, parking and hotels. There are 108,000 Artists and Creative Workers in Minnesota who support their families with their art. Students consistently involved in music and theater show higher levels of success in math and reading.